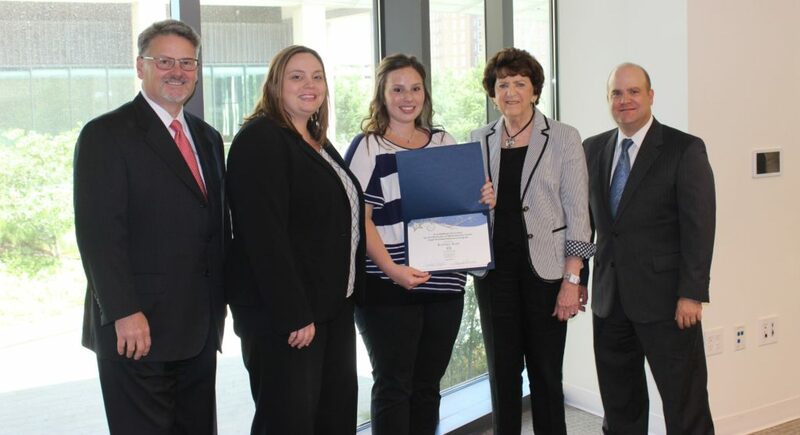 Crowe & Dunlevy recently presented Kortney Rear with the annual $1,000 B. Jo Balding Scholarship for Students in the Legal Assistant Education Program at the University of Oklahoma Law Center. A University of Oklahoma student in excellent academic standing, Rear works for a local law firm handling filings at the Oklahoma Corporation Commission and at various courthouses around the metro area, in addition to other duties. She has experience working in law offices in varying capacities since 2012. She plans to graduate with a legal assistant certificate in December 2016. Scholarship applicants must be enrolled in the Legal Assistant Education Program at the University of Oklahoma Law Center and be in academic good standing with at least an 8.1 grade point average in legal specialty courses at application submission.